Soils vary greatly, and in many parts of Montana and Wyoming, new construction must take place on soils with poor load-bearing characteristics. Without remedial work to overcome the limitations of poor soil, even well-constructed buildings, roadways and slabs are likely to suffer with settlement problems. Footings and foundation walls will crack and sink. Chimneys will tilt. Roadways and concrete slabs will crack and buckle. Fortunately, structural engineers have developed techniques to give buildings and other structures a solid, stable stance in spite of poor soil conditions. At Yellowstone Structural Systems, we understand the importance of careful site preparation to prevent soil problems from causing structural damage. Our engineered solutions are backed by Supportworks, an international network of foundation repair contractors. Helical piers are fabricated from high-strength steel; they look and work like giant screws. Helical-shaped blades welded to the shank of the pier function like screw threads, pulling the pier into the soil as the shank is rotated. A pier's load-bearing capability is measurable as the pier is driven; the torque required to turn the pier's shank is directly related to the pier's load-bearing capability. 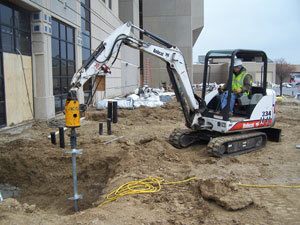 Installing helical piers prior to building a new foundation is a straightforward process. Piers are located directly beneath the planned location of footings or slabs. Once piers have been driven to their design depths (or to bedrock), the tops of the piers are cut to make them level with each other and with the footing or slab. A special new construction bracket is welded onto the top of each pier to embed the top of the pier securely in the concrete. Then construction proceeds in the conventional manner. Two other methods are sometimes used when weak soils pose risks during new construction: concrete piers and overexcavation. We usually don't use these methods for a couple of reasons. First of all, concrete piers and overexcavation still depend on weak soil for support, while helical piers can be driven to greater depth. Helical piers enable us to bypass the weak soil immediately below the structure, extending to bedrock or solid, load-bearing soil. Piers offer another advantage as well: they don't require any extra excavation or concrete work. Once piers are in place, construction can proceed immediately, without pouring extra concrete and waiting for the concrete to cure.